In May 2008, we (Max and Emily) flew out to Portland, Oregon. Emily's job had sent her to a conference and Max came out for a long weekend. We were hoping to explore Portland and see our friend Ryan. Ryan had bad news though- his band had three shows on the northern coast and he would be out of town all weekend. Exploring the coast seemed like even more fun than staying in Portland anyway, so we tagged along. 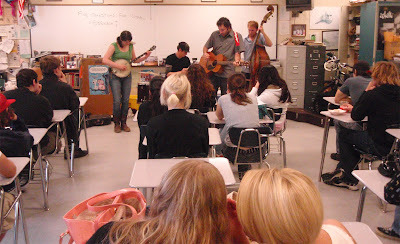 The first gig was a 10am Cinco de Mayo blowout at Israel's old high school. Watching from the back row of the classroom, we witnessed a group of otherwise apathetic teens grow more and more engaged as they played. Afterwards, over some excellent tacos and virgin margaritas, we talked about their plans to tour the coast by bicycle, and remarked that following Blind Pilot's bike tour was the documentary we had been looking to make. We traveled with them to Astoria and Seaside, and fell in love with the joy and energy that these four musicians travel with. We saw people moved by their music everywhere they went. People talk a lot about doing things that never get done, but we were determined to not let this opportunity slip away. So we sold most of our worldly possessions, gave our jobs notice we would be leaving, bought a tent, tuned up the car, and are about to head out to follow some wonderful people on bikes as they play their way down highway 101.